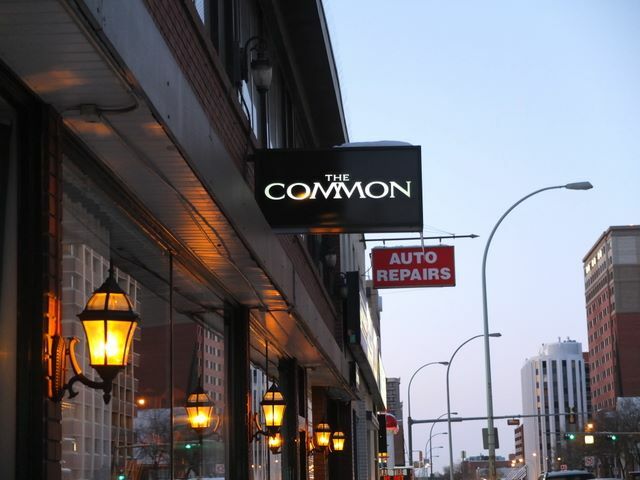 The Common is a versatile establishment both in terms of its menu and atmosphere. The menu includes the range of traditional pub food (think fish and chips) to more refined fare (confit duck, anyone?). Many dishes, such as their rabbit bangers and mash or lobster pot pie filled with chanterelle mushrooms and artichokes, straddle both realms. Visit during lunch or dinner for a lounge-like setting with dimmed lighting, and restrained energy. Friday and Saturday nights, however, a DJ arrives, the tables are pushed aside, and the floor becomes packed with masses of people dancing the week's troubles away. 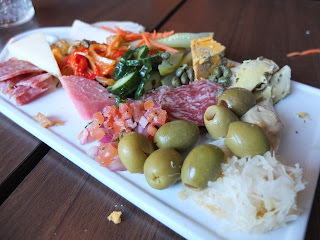 The small antipasto platter was a great start to our meal. There was plenty of variety in the meats (mortadella, salami, roast chicken), cheeses (one blue, one firm, one soft), and accoutrements. The capers, sauerkraut, and cucumber salad, in particular, I don't often see on tasting plates. There was no risk of getting bored with this platter. The Common's chicken and waffles were undoubtedly the most popular item ordered on the night of my visit, the presentation was lovely, but don't expect the typical Southern style here. 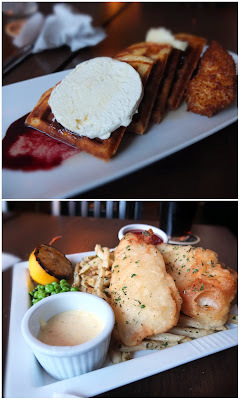 The food itself is a perfect example of comfort-gourmet fusion done right. The crisply fried, boneless chicken and toothsome waffle plant the dish in its soul food roots, while the salty goat cheese and piquant berry-chile sauce add a spirited, rejuvenating twist. The fish and chips featured the catch of the week, cod, battered and fried to a perfect crisp, atop a mountain of addictive, fresh cut kennebec fries. With an interesting and delicious menu, spot-on service, and a casual dinnertime atmosphere, I was highly impressed with my experience at The Common. Maybe next time I'll stay for the dance party.